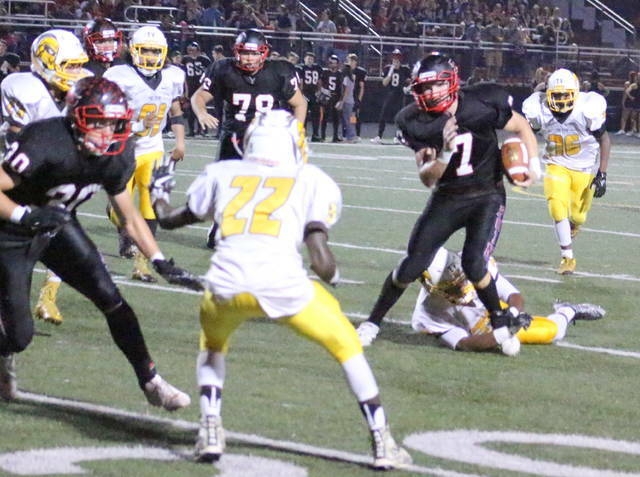 Point Pleasant senior Justin Brumfield (10) eludes a Mount View defender during the second quarter of Friday night’s Week 5 Homecoming contest at OVB Field in Point Pleasant, W.Va.
POINT PLEASANT, W.Va. — It was a golden night … just not for the Golden Knights. 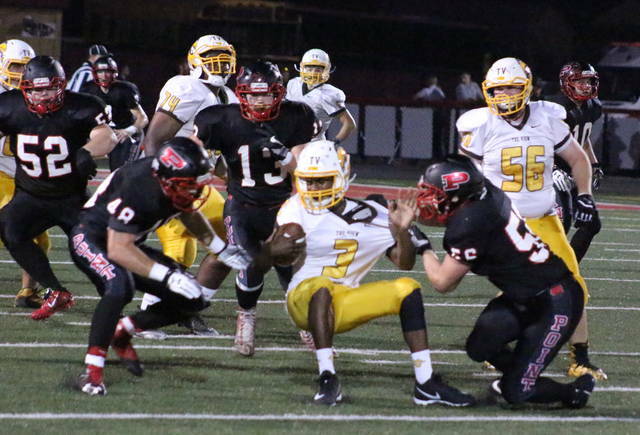 The Point Pleasant football team stormed out to an early 35-0 third quarter lead and never looked back Friday night while picking up a 35-6 Homecoming victory over Mount View in a Week 5 non-conference matchup at Ohio Valley Bank Track and Field in Mason County. The Big Blacks (4-1) won their fifth consecutive Homecoming contest in a rather convincing fashion as the hosts put up 298 offensive yards, had two interceptions and limited the Golden Knights (3-2) to just 97 total yards — all in the first half alone. The Red and Black covered 120 yards in 10 plays during their first two drives, both of which resulted in touchdowns that gave Point a 14-0 first quarter edge. After forcing a three-and-out punt on Mount View’s opening drive of the game, PPHS needed just two plays to cover 47 yards as Josh Wamsley hauled in a 33-yard touchdown pass from Cason Payne. Jacob Bryant added the first of five successful point-after boots, allowing Point to secure a 7-0 cushion with 9:19 showing in the opening frame. The Big Blacks forced another punt on the Knights’ next possession, then strung together an eight-play, 73-yard drive that ended with a 5-yard scoring run for a 14-point cushion with 4:48 left in the first stanza. Both squads traded possessions into the second period, and the guests had marched down to the Point 44-yard line before Jovone Johnson picked off a Mount View pass and initially returned it to the house. A penalty, however, negated the quick score and gave the ball to the hosts at MVHS 48. The Big Blacks needed only three Brumfield runs to cover that distance as the senior added a second TD run of 23 yards, making it a 21-0 contest with 7:16 remaining in the first half. The Golden Knights responded with a seven-play drive that yielded a few first downs, but the final play of that drive resulted in a Nick Leport interception — giving PPHS possession at its own 46. After a 4-yard run to midfield, the Big Blacks took a successful chance downfield as Tucker Mayes ended up uncovered in the middle of the field. Payne hit the senior in stride and Mayes went untouched into the end zone, giving the Red and Black a 28-0 lead with 4:48 left until halftime. 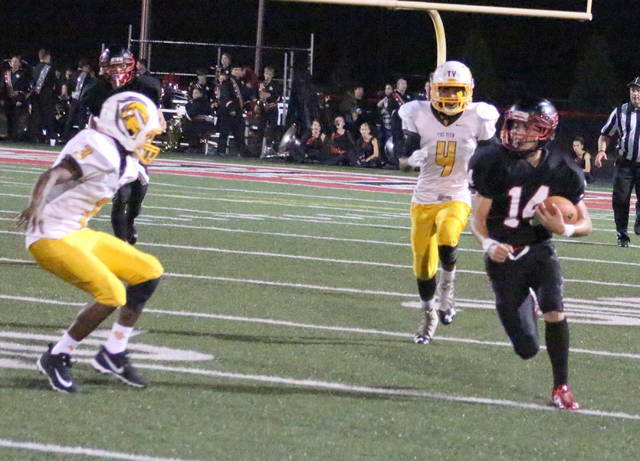 Point Pleasant held a sizable 165-6 advantage in rushing yards at the break and was also 7-of-12 passing for 133 yards, as well as owning an 11-9 edge in first downs and a plus-2 margin in turnover differential. Payne added Point’s final score with a 1-yard run to cap off the opening drive of the second half, giving the hosts a 35-0 lead with 8:59 remaining. Mount View’s lone score came on Point Pleasant’s lone mistake of the night as Jashawn Collins recovered a fumble and returned it one yard for a 35-6 count with 30 seconds left in regulation. The Big Blacks forced three takeaways and finished the evening plus-2 in turnover differential. The hosts also recorded four sacks, two tackles for loss and came away with three interceptions. Overall, Point Pleasant claimed a slim 18-15 edge in first downs and also outgained the guests by a 379-220 margin in total offense. PPHS was flagged four times for 30 yards, while the Golden Knights were penalized eight times for 42 yards. The Big Blacks put up over 240 rushing yards for a fourth consecutive week after churning out 248 yards on 36 attempts, an average of 6.9 yards per attempt. It was also the third time this fall that PPHS had two rushers go over the century mark in the same contest. 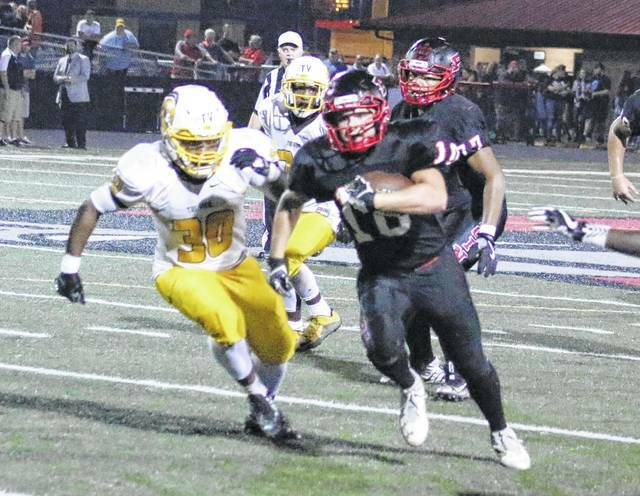 Brumfield led the Red and Black with 108 yards and two TDs on nine carries, while Payne had a score and 103 yards on 14 totes. Keshawn Stover also had 20 yards on six attempts. Payne was 9-of-15 passing for 131 yards while throwing two scores. Mayes led the wideouts with 74 yards and score on four grabs, while Wamsley added 36 yards and a TD on two receptions. Eddie Mayes and Cameron Nott each had 1.5 sacks to lead the Point defense, while Brumfield also recorded a sack. Leport added a second interception in the second half and joined Alec Smith with a tackle-for-loss apiece. Mount View mustered only 52 rushing yards on 30 attempts, with Elijah Barner (16-74) and Demicko King (3-14) yielding the only gains for the guests. Elijah Collier finished the night 20-of-35 passing for 168 yards to go along with three interceptions. Collier completed passes to eight different receivers, with Marqus Rice leading the way with five catches for 47 yards. 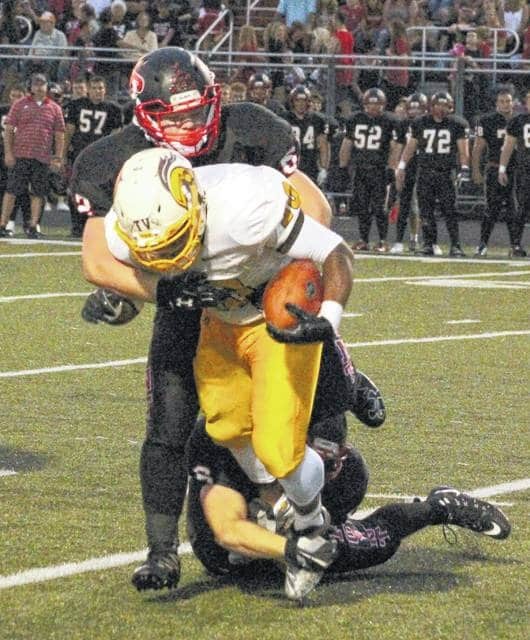 Point Pleasant begins a two-game road trip next Friday when it travels to Parkersburg South for a 7 p.m. kickoff.